Director, Siddha Central Research Institute, Central Council for Research in Siddha, Ministry of AYUSH, Govt. of India, Arumbakkam, Chennai 600106, India. Correspondence to: CITE THIS RESEARCH AS Mattummal R, Gopi DK, Sundaramoorthy B, Bobbili E, Andalil R, Sunil Kumar KN, Parameswaran SR. Morpho-anatomical evaluation of Punkam poo (Pongamia pinnata (L.) Pierre) a main ingredient of Siddha formulation Punkampoo Choornnam. J Ayu Med Sci 2018;3(1):318-25. Different parts of Pongamia pinnata (L.) Pierre shows valuable pharmacological activities. The flowers are used as major ingredient of Pongam poo choornnam, a siddha formulation used for reducing the constant rise of body temperature due to veneral diseases. This study is a detailed pharmacognostic evaluation of the macro and microscopic characteristics to authenticate P. pinnata flowers. The flowers were collected from Siddha medical college campus Arumbakkam and detailed pharmacognostic study employing morphological, anatomical, quantitative and powder microscopy was performed following standard procedures to assess authenticity of P. pinnata flowers. The detailed microscopy of flower showed the presence of mesophyll cells and vascular bundles on the floral parts; quantitative microscopy revealed the dense distribution of trichomes on both surfaces of calyx and corolla, the epidermal number, trichome number, vein islet and vein termination number were also recorded; powder microscopy showed the presence of characters like epidermal cells, trichomes, parenchyma cells, vessels, fibres and pollen grains. This work will serve as an informative record of macro-microscopic features of this valuable floral drug. Siddha system is one of the ancient system of medicines originated in South India. It has unique diagnostic procedures and makes use of herbs, animal products, metals and minerals either as single drug or polyherbal/herbo-mineral formulations to treat various diseases. Punkam (Pongamia pinnata) belongs to the family Leguminosae is an avenue tree commonly known as the Indian beach tree. It is an Indo-Malaysian species, a medium-sized evergreen tree, common on alluvial and coastal situations from India to Fiji. The plant is fast growing, with glabrous leaves, deciduous branches; leaves imparipinnate, flowers fragrant, white to pinkish, in axillary racemes. Several flavone and chalcone derivatives such as pongone, galbone, pongalabol, pongagallone A and B have been reported from the leaves and stems. P. pinnata seeds contain sterols, and derivatives together with fatty acids. Various parts of P. pinnata have been considered as valuable source and are used for a variety of applications in agriculture and medicine. In traditional medicine systems like Ayurvedha and Siddha, P. pinnata is used for the treatment of clinical lesions of skin and genitalia and in folk medicines the fruits are used for treating tumors and the seeds are used in bronchitis, whooping cough, chronic fever, skin diseases and painful rheumatic joints. Seed oil is used in scabies, leprosy, piles, and its oil is a source of biodiesel and also used as fuel for cooking and lamps. The flowers are a good source of pollengrains with adequate nectar and have a wide application in apiculture. Dried root bark of P. pinnatais used in a Siddha formulation Punkat Tailum which is mainly used to cure fever, cough and gastric problems and the seeds are used to make Kankasa mattirai an important formulation used to treat eye and skin diseases. Dried flowers of Pongamia pinnatais the main ingredient of Punkampoo choornnam along with ghee. A number of pharmacological activities are being reported from the plant such as antiplasmodial properties, anti-inflammatory, anti-ulcer, anti-hyperammonic, CNS depressant activity etc. 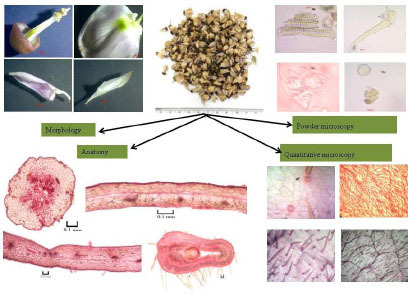 While there are no much studies on flowers the present study aims to characterize the morpho-anatomical features of Pongamia pinnata flowers. The plant twig with flowers were collected from Siddha medical college campus Arumbakkam andauthenticated in the department of Pharmacognosy, SCRI Chennai. The macroscopy of flowers were documented by Nikon COOLPIX5400 digital camera. Dissected floral parts were studied using Zeiss Stereo Discovery V.8attached with Zeiss AxioCam ERc5s digital camera to reveal the morphology of the flower parts. For microscopy all flower parts were hand cut into transverse sections using a 7’o clock platinum blade, stained with safranine and photographed using Nikon ECLIPSE E200 trinocular microscope attached with Nikon COOLPIX5400 digital camera under bright field light. Magnifications were indicated by the scale-bars. Some flowers were dried, powdered, passed through mesh no. 60, and preserved in an air-tight covers for powder microscopy. The powder was mounted in glycerine on a clean microscopic slide, observed under Nikon ECLIPSE E200 trinocular microscope magnified to 400X and diagnostic characters were photographed. Quantitative microscopy of both sepal and petals was done by peeling epidermis and boiling about 20 minutes with 10% NaOH solution followed by staining to quantify the epidermal, trichome, vein islets and vein termination numbers on the surface of calyx and corolla using Camera lucida (Parco prism type) attached with the compound microscope . Flowers pedicellate, complete, bisexual, zygomorphic, 15 to 18 mm long with a pinkish white color when fresh which becomes brown in color when dried; calyx cup-shaped, truncate, gamosepalous, 5-toothed,aestivationvalvate; corolla papilionaceous and glabrous, petals 5, polypetalous, aestivation vexillary; stamens 10, diadelphous 9+1; filaments fused to form a stamina tube which encloses the long ovary, anthers free, basifixed, extrorse and dithecous, tetra sporangiate, dehiscing longitudinally; ovary subsessile, superiour, monocarpellary, unilocular with one ovule; style hairy and curved; stigma capitate (Figure1). The CS of pedicel is round with wavy outline having ridges and furrows. Three regions can be clearly visualiuzed; outer epidermis, middle cortex and the inner pith. Epidermis is covered by cuticle and unicellular, uniseriate trichomes and is composed of single layer of rectangular compactly arranged thick walled cells. The cortical region is formed of 4 to 6 layers of thick walled parenchymatous cells which contain small amounts of chlorophyll providing photosynthetic efficiency to the pedicel. The parenchymatous inner cortex contains radiallyarranged xylem and phloem.The inner most region is occupied by pith (Figure2). TS of sepal taken from the calyx cup show a uniseriate epidermis on both sides with thick cuticle. Epidermis bears unicellular trichomes in very dense proportion. Mesophyll composed of 4 to 7 layers of loosely arranged parenchyma cells of which outer layers are oval shaped and becomes elongated towards the vascular bundle, few of the mesophyll cells contain prismatic crystals. A row of vascular bundles is present at the centre alternating with transfusion tissues. 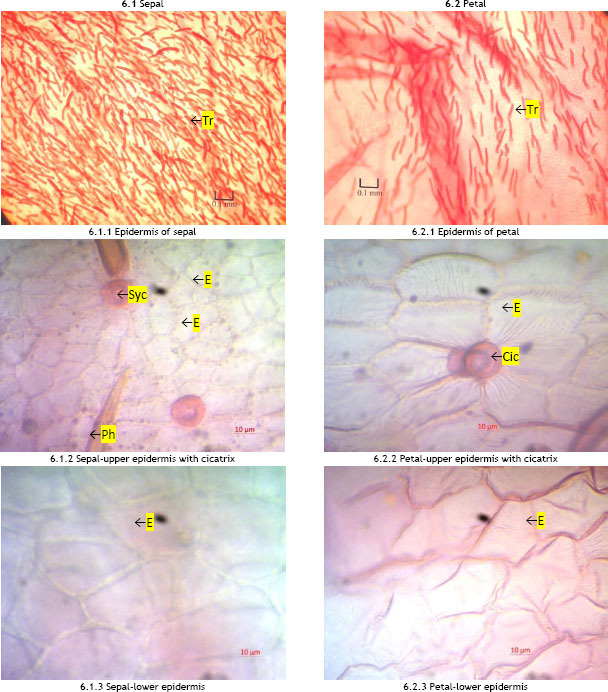 The vascular tissue contains normal elements with phloem towards periphery and xylem towards inner region (Figure3). 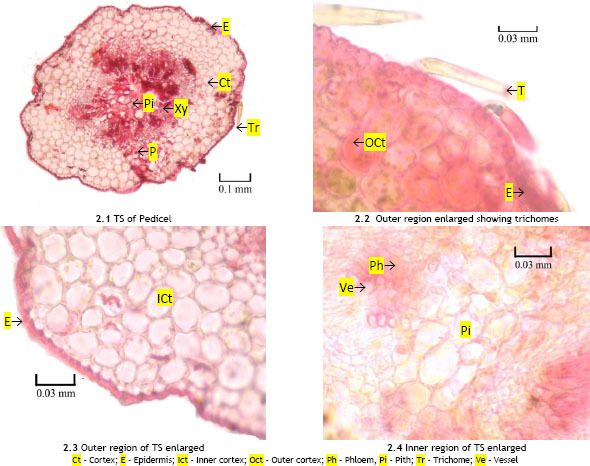 TS of petal shows adaxial and abaxial epidermii formed of cubical epidermal cells covered by cuticle and bears unicellular trichomes which are less in density when compared with that of sepals and is followed by compactly arranged single layer of hypodermis. The mesophyll consists of circular to oval shaped 6 to 7 layers of parenchyma cells with intercellular spaces. 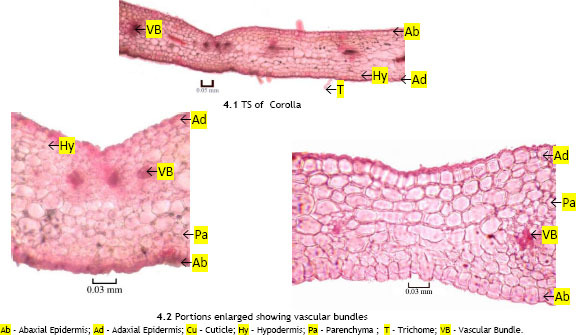 Vascular tissue is composed of few bundles (Figure4). The ovary is short stalked or subsessile, pubescent; bearing trichomes on the outer epidermis, monocarpellary with a single compylotropous ovule on marginal placentation (Figure5). The calyx and corolla were separately subjected to quantitative microscopy. It revealed the presence of dense unicellular trichomes on both the surfaces. In petals the upper epidermis was formed of isodiametric cells while in lower epidermis it was wavy cells. The standard, wing and keel petals showed nearly the same density of trichomes (Figure6). 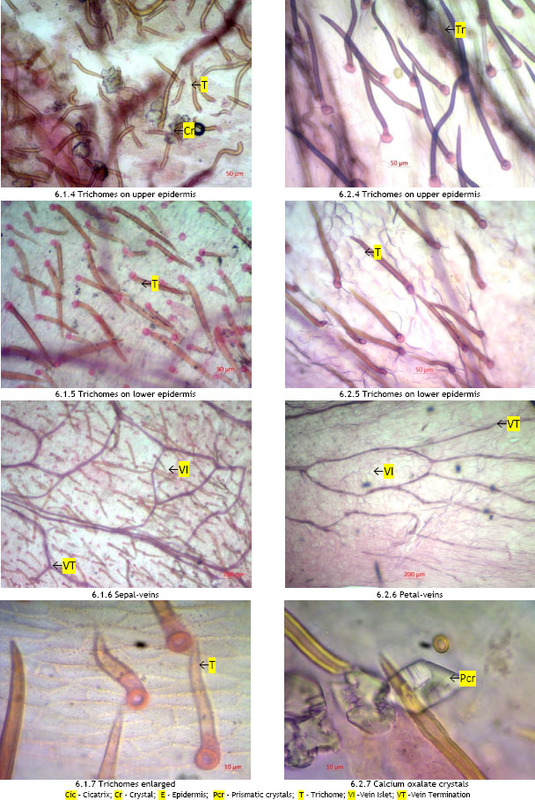 Other quantitative microscopic features were used to clearly differentiate sepal and petal fragments under microscope (Table 1). 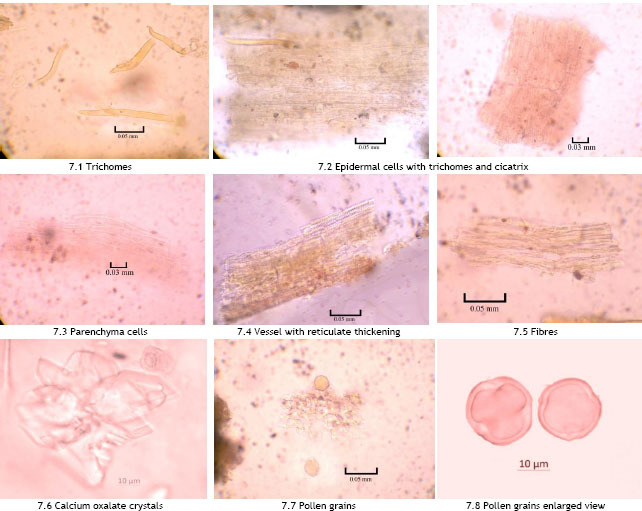 The powder shows thin walled epidermal cells bearing cicatrix, numerous uniseriate trichomes with acute tips, elongated thin walled parenchyma cells, short fibre bundles, vessels with reticulate thickenings, calcium oxalate crystals formed of oblique rhomboidal prisms and tri zono colporate pollen grains (Figure 7); brown colored with slightly bitter taste and characteristic odour. This study shows the papilionaceous nature of the P. pinnata flowers which is matching with the findings of Tucker.The presence of numerous trichomes observed in all floral parts are in accordance to the study of Hashemi which may aid in pollination and may lead to the increased tolerance to drought by reduction in the absorbance of solar radiation. Even though the flowers showed ‘papilionaceous syndrome’ unfused keel petals were observed in the present study as recorded in the two species of Cercis by Tucker, while Siahpoosh et al, 2015 has reported united keel petals in Vigna radiata, which is also a Leguminosae member. Leguminosae members like Crotalaria retusa, Vigna radiate, Cajanus cajan, Trifolium pratense possess hollow style as reported in previous studies[19-21] while P. pinnata has a solid style. Study on Glycyrrhiza glabra by Hashemi emphasized the occurrence of disc shaped stigma with monocarpellary campylotropous ovules whereas Pongamia showed capitate stigma with similar ovules. 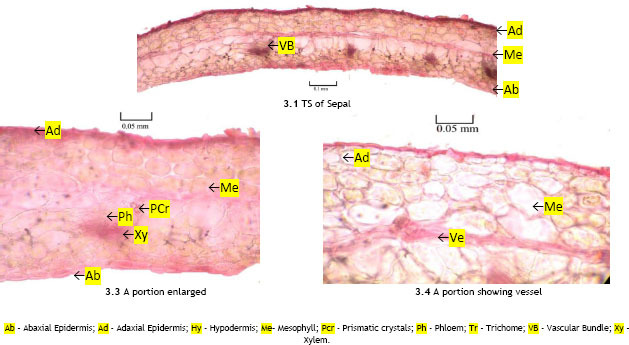 TS of sepals showed only one layer of epidermis while Siahpoosh et al observed two layers of epidermis in Vigna radiata. Barth 1990 documented the formation of abundant microspore mother cells giving rise to large number of pollen grains and this study also recognized the same. Thus it’s clear that morphological and anatomical characteristic features are very important and can be used as a diagnostic key for differentiation of taxa at all taxonomic level. Since the flowers are papilionaceous there is a chance for adulteration with flowers of similar morphology. 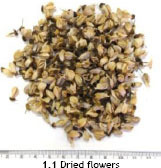 So the macro and microscopic profiles generated in this study will be an effective tool for the authentication of this floral drug. This detailed floral morphology and anatomy of the P. pinnata flowers is the first hand report on the microscopy of floral characteristics. The authors extend their heartfelt thanks to Director General, Central Council for Research in Siddha, Chennai for the support. Mrs. Rubeena did the planning and conceptualization of the work, Dr. Divya contributed towards the design and data acquisition, Mrs. Brindha carried out the morphological study, Mrs. Remya did the anatomical studies and Mrs. Erni carried out the powder microscopic studies. Manuscript analysis and editing was carried out by Dr. Sunil Kumar. The Siddha aspects of the drug were provided by Dr. Sathyarajeshwaran. Remya A, Brindha S, Divya KG, Sunil KKN, Sathiya Rajeswaran P , authors. Atlas of Macro-microscopy of Savuripazham of Siddha - Fruit of Trichosanthes tricuspidata Lour. J Ayu Med Sci. 2017;2(1):152–6. DOI:10.5530/jams.2017.2.3. Structural and anatomical study of Glycyrrhiza glabra L. during developmental stages , author. available at. https://www.researcggate.net/profile/ZaharaHashemi19/publication/309770589. accessed on 01/03/2018. ‹ Pharmacognostical and Phytochemical Characterisation of Cork and Seed of <italic>Tamarindus indica</italic> Linn.